UPDATE 3/15/18: Facing a few simple facts clarifies the gun issue, much to the dismay of the hysterical anti-NRA/Second Amendment crowd. UPDATE 2/23/18: Whole lotta CYAin’ goin’ on in Broward County, FLA. Lots and lots. 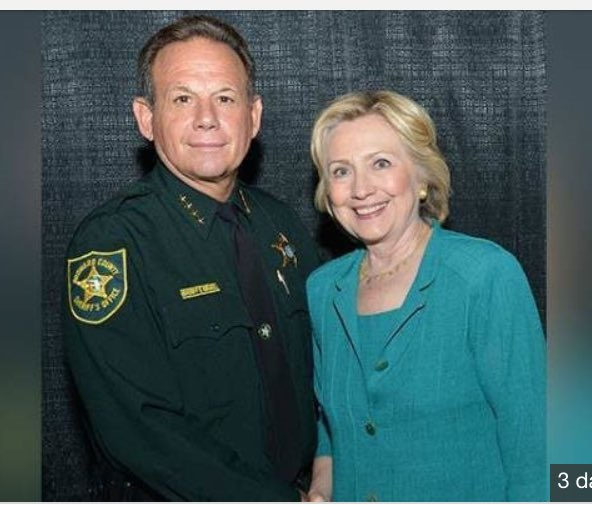 Minimal exertion required to connect the dots, starting with this picture of man-on-the-hotseat Sheriff Scott Israel and friend. Prog policy has consequences. An online shot is forever. UPDATE 2/20/18: If interested in real solutions to school shootings, look to Israelis who knows the problem all too well and have handled it with characteristic effectiveness. UPDATE 2/19/18: A few commonsense preventive measures are there, waiting to be implemented. It’s a dangerous world as it always has been. 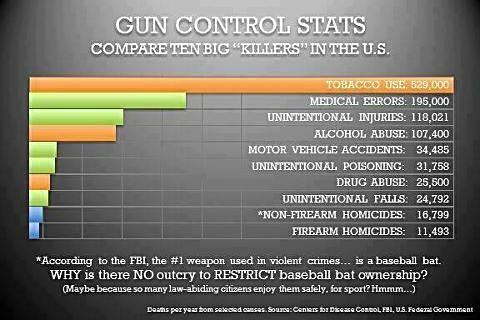 Making guns illegal makes them accessible only to criminals. The same predictable Ban-The-Guns crowd comes out squealing on cue as 17 young people lie dead in a Florida school. Naturally, their rage is directed NOT against a certain, specific, individual demonic scum bucket bound for hell but rather, of course, Trump supporters, the NRA, the old fogey Founding Fathers and their out-of-date Second Amendment. Anything is to be condemned except for the evil (sub)human being responsible. Nor is any solution put forth except to punish an entire nation of responsible adults for the actions of one lunatic. Control, control, control, the melody and theme, the droning monotone of the Left. One can cite the numbers of deaths caused by drunk drivers and motor vehicle accidents vs. those caused by firearm homicides here and here and here and here and here. But somehow, there is no hysterical outcry for banning liquor and motor vehicles. In the skewed worldview of the Left, nothing bad like this would happen if Barack or Hillary or, ideally, a Fidel, Hugo or Kim Jong Un were there at the helm, banning all danger, protecting us all from ourselves like a bunch of children. Like any fear deliberately sown among the populus, everything is a crisis not to be wasted by those who would turn America into an Orwellian “peaceful” paradise. Bad weather, bad breath, bad people, bad feelings, bad form, even a bad-tempered Mother Nature with her tidal waves, exploding volcanos, earthquakes, hot & cold spells would all be things of the past if only the compassionate DC and UN Progs were up there pulling the strings. The FBI, supposedly the government agency that exists to prevent such horrors, was asleep at the switch, no doubt distracted by its collusion with the Dem Party to Get Trump. Perhaps a solution that works best is in order: how about one well-aimed bullet from an armed school guard that might, just might disable or kill the next subhuman contemplating a little mass murder? Naturally, self-defense as a universal option, Constitutional right and basic adult responsibility is not under consideration. The guns did it, not the maniac who plotted, planned, bragged online about his future as a “professional school shooter” and pulled the trigger. 4 Responses to Drunk drivers kill more than shooters. 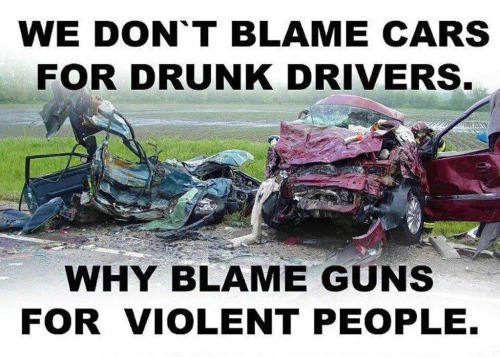 Where’s the cry for bringing back Prohibition and banning autos? I’m glad that the Left was never made aware of Michael Skakel beating Martha Moxley to death with a golf club as the din of “ban the 6-iron” would have been deafening and I would be relegated to bird-watching. If you’re a Kennedy or a Skakel or anyone else on the Left, golf clubs, baseball bats, knives, ropes, guns are the responsible parties for anything unpleasant that might occur. On the other hand, since we know in these specific instances that inanimate objects can’t do anything without a little help, everything is fine, and nothing of any consequence has happened. Got all that?